Appliance: Any object attached to your teeth by the orthodontist which causes your teeth to move or changes the structure of your jaw. Archwire: This thin, metal wire conforms to the alveolar (dental arch) that is used in conjunction with braces and acts as a source of force to guide teeth as they move and correct irregularities in the position of the teeth. This wire is adjusted periodically throughout treatment as the teeth begin to settle into their intended final positions. Band: A metal ring that gets cemented around a tooth. This band, which completely encompasses the tooth, provides an effective method of attaching brackets to your teeth. Bond: The seal that results from orthodontic cement that holds objects firmly in place. Bracket: The metal or ceramic part that gets “bonded” or cemented to your tooth. It is used to hold the archwire in its correct place. Coil Spring: A helical spring that is placed between brackets and over an archwire in order to create space between crowded teeth. Elastic (rubber band): A tiny rubber band that is hooked between different angles on your appliance whose purpose is to apply pressure to encourage your teeth to move toward their new final position. Elastic Tie: This tiny rubber band fits around your bracket and holds the archwire securely in position. These ties come in a wide variety of fun colors. Headgear: A type of orthodontic appliance that uses an external wire device known as a facebow to guide facial and jaw growth by moving teeth toward their desired positon. The appropriate force is applied via a neck strap that is loaded by a spring or with a head strap, which will have a safety release on it that will automatically disconnect in the event the facebow is unexpectedly yanked or pulled. Headgear Tube: A hollow adjustment that is round in shape and located on your backhands in which the inner piece of your headgear will fit into. Hook: Sometimes welded, it is a retractable arm in which elastics can be secured. Ligature: The thin piece of wire that is used to securely hold your archwire into your bracket. Lip Bumper: A lip bumper consists of an arch wire that is fastened to a piece of molded plastic. Its purpose it to hold back the bottom molars in order to create more space for the other teeth. Mouthguard: An apparatus used to protect the mouth, teeth, and lips from injury when participating in a sports or other physically-demanding activity. Palatal Expander: A devise used to increase the width of your upper jaw. Retainer: This appliance is worn once your braces are removed. It works by attaching to your upper and lower teeth and holding them securely in place. Many retainers can be taken out daily, while others are bonded to the inner sides of the teeth for a more permanent solution. Separator (Spacer): A ring that is small in size and made of rubber that is used to create space between the teeth before the bands are placed. Tie Wire: A thin wire used to secure the archwire. It gets twisted around your brackets. Wax: Wax is commonly used to prevent irritation from occurring as a result of your lips rubbing across your braces. Banding: This consists of the process of sizing and cementing orthodontic bands to the teeth. Bonding: This involves attaching brackets to your teeth with the use of a cement which is used primarily by orthodontists. Cephalometric X-ray: This x-ray of the head shows general positions and growth patterns of all facial areas, including the jaws, face, and teeth. Consultation: An initial meeting with the orthodontist in which a treatment plan is discussed and chosen. Debanding: The removal of orthodontic rings from around your teeth that have been cemented and banded. Debonding: The removal of brackets from the teeth. Impressions: This procedure involves making a negative print of your teeth by simply chomping down in a soft material that will harden into a molded print of your teeth. These impressions will be used by the orthodontist to create an appropriate treatment plan. 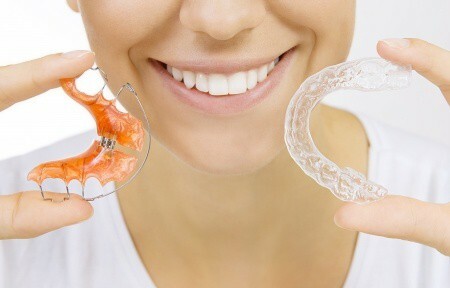 Invisalign: This orthodontic device is an alternative to traditional braces. It uses transparent, custom-molded aligners to straighten your teeth. This procedure is an effective way of correcting many orthodontic problems, though it doesn’t correct 100% of these issues. Ligation: This procedure involves affixing an archwire to the brackets that are on your teeth. Panoramic X-ray: A rotating x-ray that moves around your head to take prints of your jaw, teeth, and other areas of the face. If you are in need of any orthodontic work, please give our office in Brunswick or North Royalton a call at 330-558-9092 to set up your consultation.